I thought you’d enjoy these wonderful mural paintings. For those who do not know them they’re in a tiny chapel called the Oratory, which is the last remaining survivor of the old Dominican Convent in Dun Laoghaire, (the town just south of Dublin where I grew up). The Oratory Chapel is dedicated to the memory of boys from the local Christian Brothers School. In 1914 and 1915, they joined the army and fought in the First World War, in the trenches and mud of the western front. The regiment they joined fought mostly in Belgium, where many of these young Irishmen died. After the war, Belgium people from the local town were touched by the sacrifice. As a memorial to the young Irishmen, the townspeople donated and dedicated this sacred heart figure of Christ that you can see just above. 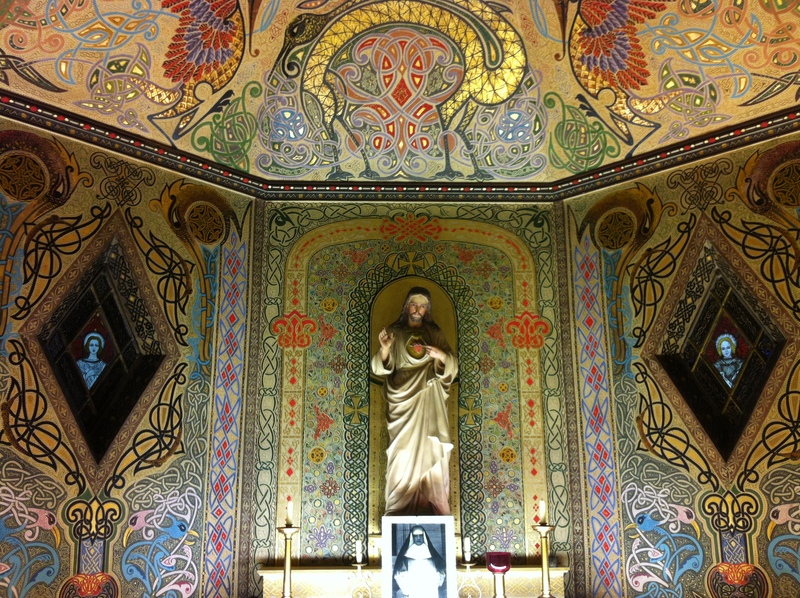 The chapel was then built especially to accommodate the sacred heart figure of Christ. But it was just a bare building, with plain white walls. 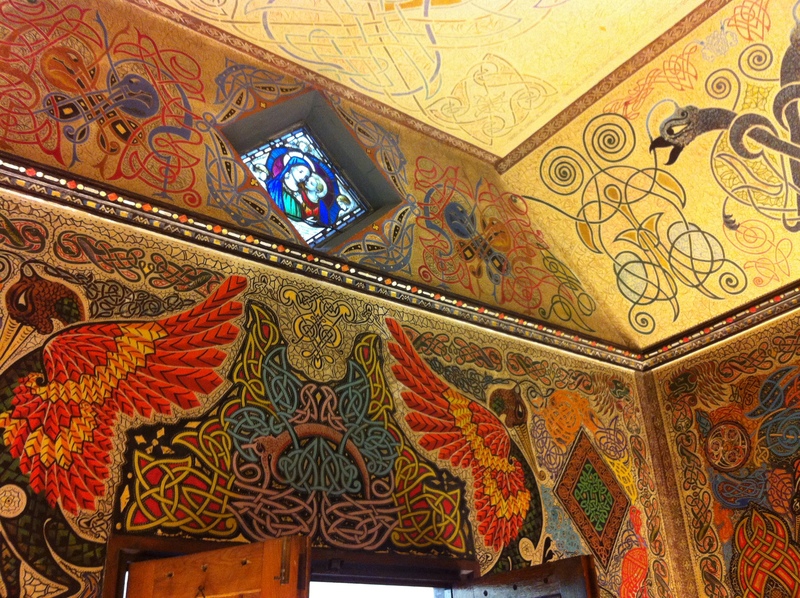 But then, over a 19-year period following the War, the walls were all painted by a remarkable woman. She was a nun, called Sister Concepta Lynch, and she took this job on using all her spare time from duties at the convent. 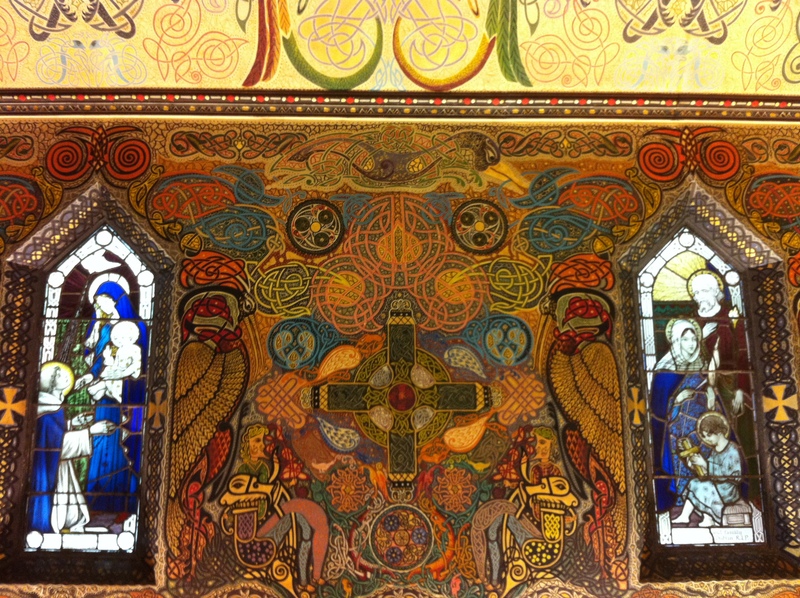 It’s not hard to see why the chapel has been described as walking into a three-dimensional Book of Kells. Personally, I think it is stunning. The stained glass windows are by the famous glass artist, Harry Clark. Many depict scenes from the Nativity. These windows were paid for by private donation or by public subscription. Sister Concepta Lynch donated all her own time and labour for free. She was clearly an extraordinary woman. Prior to taking holy orders and becoming a nun, she had previously run a successful business in the centre of Dublin. This room is her unique legacy, to the memory of young local men who had dies so young, fighting for something they believed in. The Belgium townspeople offered the Sacred heart figure to the Christian Brothers school the young men had attended. But in the new, nationalist era of early Independent Ireland, afte 1921, the school did not want to highlight the fact that many of its former students had fought in the British army in the First World War. That is why the Dominican Convent ultimately ended up accepting the gift from Belgium. And how Sister Concepta Lynch ended up creating this extraordinary, quite unique, work of art. Taken all together, it’s a real piece of Hidden Dublin, and almost unknown. Even in Dun Laoghaire itself, not everyone is aware of its existence. But as a quiet piece of contemplation, of generosity of spirit and beauty, dedicated to memory and sacrifice, it’s hard to beat. Anyway, I thought you might like to see it. 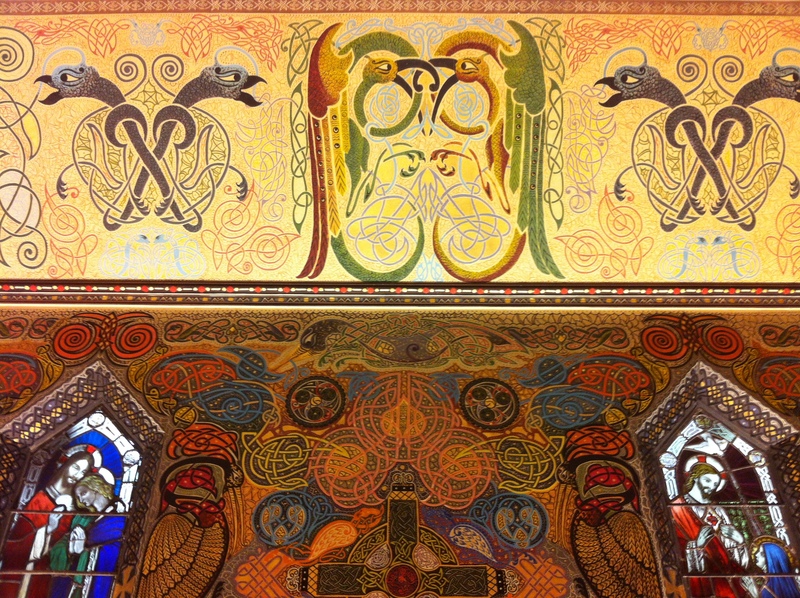 if you like beautiful arts, decorative, applied arts & architecture, woven into history, you might enjoy doing a Dublin city walking tour some time with Arran Henderson of Dublin Decoded tours. The programme for our summer walks, 2015 is here. if you can’t make any of our 6 summer walking tours, but would like to receive notice of future scheduled tours (open to all) you can join our our mailing list to receive the monthly Dublin Decoded newsletter, with monthly notifications of our acclaimed tours and events. Its also possible to book your own custom Dublin Decoded tour, on a date of your own choice. For private custom tour enquiries, please send an email. If possible please include your preferred dates and preferred tour in your subject header to ensure speedy response) Emails can be sent to dublindecoded@gmail.com Please read the website first as there’s the choice of tours and lots of other information already there and please note we are unable to offer tours on week-day mornings. Tours on Mondays to Fridays generally commence 2.15pm. We are delighted to enjoy many rave reviews and a 5-star average on TripAdvisor. Reviews and testimonials can be seen here. Nadolig llawen, Arran, a Bleuddyn Newydd Dda. What a stunning Christmas card, Arran. 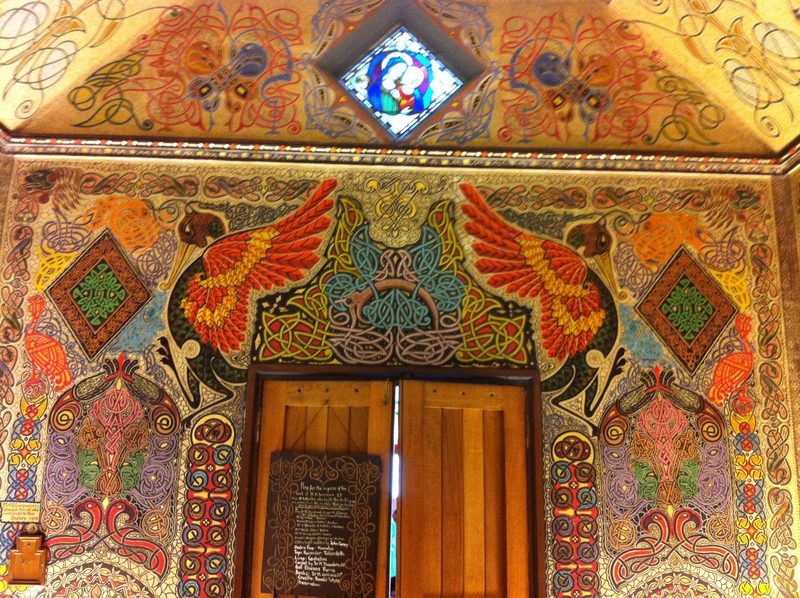 Thank goodness this chapel was spared the chop—it’s incredibly beautiful work. Thanks for the post, as ever, informative and beautifully put together. Happy Christmas and looking forward to your posts in 2014. Thank you so much Jane. Delighted you enjoyed this. Wish you and yours a super holiday too, and a fantastic 2014. Thank you for all the support over the last year, it has been much appreciated. A. What a fantastic post Arran. I’m astonished such a place of beauty wasn’t knocked for a few more shops and, being mercifully protected, hasn’t got hoards of tourists in and around it. Another place I’ve probably walked or run by obliviously. I’m a total art philistine but I think Harry Clark’s work is magical, but the whole thing is fantastic. Keep up the good work in 2014. Thanks Roy, wishing you a fantastic 2014 also. Very, very beautiful, Arran! Thank you for sharing it! 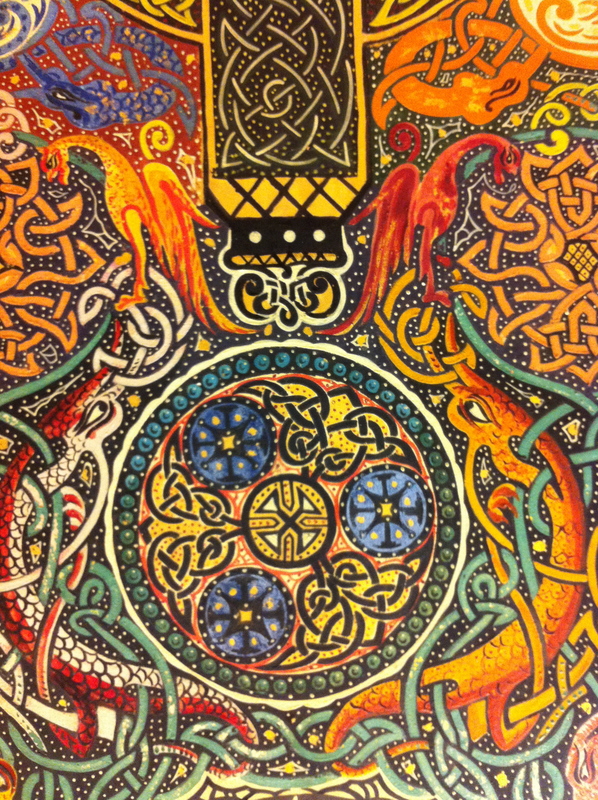 I am a new follower from Idaho in the United States hoping to visit Ireland in 2015. If I am in Dublin when you are, it would be nice to meet you and take one of your tours. Dear Darwin, thank you for the kind words on the post, I agree this little chapel is beautiful, it’s a great shame it is not better known. I’m absolutely delighted you’ve subscribed. And absolutely, if you come to Dublin you must come on one of the tours, I really think you’d enjoy that. When are you planning to make the trip over ? Either way, welcome on board. 🙂 Very kind wishes for 2014. – Arran. Best wishes for 2014, Maestro! And the very same to you Maestro! Can’t tell you how much I’ve enjoyed your tours and excursions this year. Looking forward to more in 2014. Hope you have a super year. Beautiful pictures, Aaran, and I hope you had a wonderful Christmas with your family! If I ever get over to your lovely Ireland I’ll be signing up for one of your tours. Here’s wishing you a peaceful, joy filled 2014! Many thanks Mellie; delighted you enjoyed. Look forward to welcoming you on tour one day in Ireland. -AQH. Amazing art. Thanks for the tour. Merry Christmas & Happy New Year. Yes, it is a wonderful place. And yes, Definitely drop us a line if you ever make it over for Ireland, maybe a few weeks before, and we’ll make sure you get the best tour possible. Many thanks for getting in touch and for subscribing. A very Happy New year, to you and yours. – AQH. Hi Patricia, I don’t run the chapel myself, although with my firm Dublin Decoded I run tours to places like it, various different places, once a week or so. For opening times/date to the chapel itself, you should contact Dun Laoghaire-Rathdown County Council. Tell them Arran Henderson at Dublin Decoded tours sent you. 🙂 They are very nice and will try and accommodate you. I did read a couple of weeks ago they were having open days in May. March might be a bit early, although it’s always worth contacting them, as you never know. Enjoy your trip to Dublin, have a great time! Best regards. -Arran. Just saw this a few weeks ago in person and was stunned that there are no publications on this amazing work. Do you know of any professional photographs or way to obtain more literature about this wonderful place? Yes, it’;s a wonderful place isn’t it? Utterly unique. I’m not aware that there are any publications, in the sense of a whole book about the Oratory. But i believe that the historical Society of Dun Laoghaire had an article about it some years back, in their journal or their newsletter, So you could chase that up. Sorry i don’t have any specific date or issue number or such reference i can pass you. or any links I can paste here either. But if you look for the Dun Laoghaire Hist Soc, (or whatever they call themselves) I’m sure you will find them. and their journal and the article on the Oratory eventually. DLR library is also a good place to start, they have a very, very good history/ local section, complete with its own dedicated librarian, who seems excellent. I’d start there if i were you. Very nice place to be anyway, a real pleasure to be there. Such a beautiful modern building. Best of luck with your further researches. – Arran Henderson. I was a pupil at St Mary’s, Dominican Convent in Dun Laoghaire from 1978 until 1983 and remember the little oratory very well. By huge coincidence (because she was from Limerick, and spent her married life in Dundalk – which is where I was born, and which is almost 100 miles from Dun Laoghaire) my maternal grandmother was, before her marriage, a teaching assistant at St Mary’s in the immediate postwar period/early 1920’s, and on many occasions acted as Sr Concepta’s “lookout” when she was working on the oratory, as Sr Concepta needed to hitch up her habit in order to paint the ceiling and upper part of the walls of the oratory! Dear Catherine, thank you so much for your nice message. That is a wonderful piece of reminiscence from your grandmother. Thank you very much for passing it on. I loved it. Seasonal greeting to you and yours. -Arran Henderson, and Dublin Decoded tours. An absolute jewel of a location and so little known. Great to see the blog post and the work now by dlrcoco to get people to visit it. I’m sure there is a whole other story in the fight to save it from the wrecker’s ball and the construction of the new building to preserve it into the future. I love the lookout story above. Thanks very much for the kind words Polo. I entirely agree with you it’s a hidden treasure. I never heard of this jewel . Well done Arron . Oh it’s beautiful Gary. Well, well worth a visit. -Arran. A billion thanks for your fabulous coverage of a hidden miracle – no signposts when my spouse and I visited! The pleasure is all mine. Many thanks for taking the time to comment. It’s always appreciated. 🙂 Arran. Next Post Pictures from the Forty Foot swim, Christmas Day in Sandycove.